(or the reverse: a human-driven forklift would take from the racks and stack and place the materials so that they could be transported autonomously by a Seegrid tug to where the material was needed). Now Seegrid is introducing an $80,000 driverless walkie stacker using an off-the-shelf* Class III forklift chassis equipped with Seegrid’s vision-guided autonomous navigation system so that the new device can provide the additional functions to transport: pick, stack and put away*. 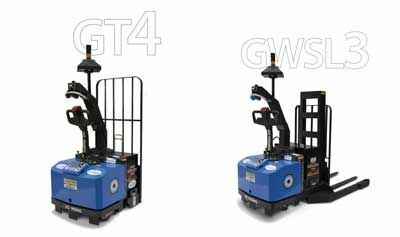 The tablet-driven walkie stacker GWSL3 is equipped with Seegrid’s vision-guided autonomous navigation system and will be launched at MODEX 2014 in Atlanta this coming March 17-20. The new walkie stacker will work in conjunction with Seegrid’s new $75,000 vision-guided GT4 tugger. Both the walkie stacker and the tugger can also be leased instead of purchased. * There have been rumors that Seegrid has chosen to focus on what it does best: provide vision, scanning and navigation systems and purchase off-the-shelf tugs and forklifts and outfit them with their special equipment and software. It is not known whether the new GWSL3 and GT4 are fully built by Seegrid or not.